No Fee! Best Prices! Knowledgeable Staff! Fishing is a popular activity at the lake and the 17’ Fishing Boat is ideal for a small group of fishing buddies. Common fish found in Lake Mead include Largemouth Bass, Rainbow Trout, Striped Bass, Crappie and Catfish. Specifications: Length 17' / Beam 72" / Draft 18"
This ski boat, the newest option in the fleet, is the best option for wakeboard and ski enthusiasts. With its coyote-like speed, agility and nice list of amenities, the 21’ Powerboat is perfect choice for you and your friends to enjoy the lake. 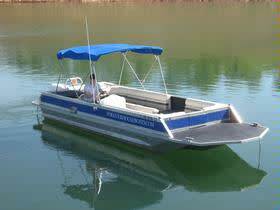 Specifications: Length 21'/ Beam 102"
The 26' Deck Boat is the ultimate day cruiser with upholstered seating for 8-10 people. Powerful, fast and maneuverable with a V-bottom hull that skims over the water much like a bowrider, these boats are perfect for tubing or cruising the lake at faster speeds than a houseboat. Specifications: Length 26' / Beam 96" / Draft 20"
When you're looking for the comfort of a houseboat with the ease of a day use boat, the Patio Pontoon is your perfect solution. A hybrid between a day use boat and a houseboat, the 44’ Patio Pontoon is the perfect solution for those looking for the amenities of a houseboat for day use. 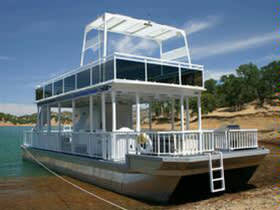 The pontoon features a 360 sq. foot sun deck with waterslide, gas BBQ on the front deck, wet bar, ice chest and an accessible bathroom with toilet, shower and sink. Specifications: Length 44' / Beam 14' / Draft 24-28"
Cruise the lake with comfort and convenience on a Personal Watercraft rental, perfect for two riders. 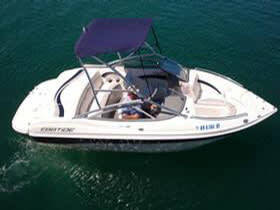 It's a fast, fun and thrilling way to explore the many coves and beaches the lake has to offer. Make your lake adventure even more fun by renting a water toy to go along with your small watercraft rental. *The Security Deposit is refunded upon return as long as it is returned in the same condition as it was rented. **Damage Waiver is an optional fee. Please note: Reservations can only be made for full day rentals. Half day and hourly rentals are available at a first come, first serve basis at the marina. 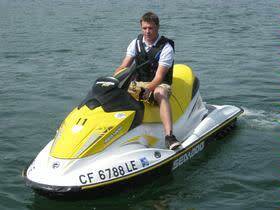 Watercraft rentals do not include fuel, waiver of liability, taxes, surcharges, or other fees that may apply. Watercraft daily rental rates vary by marina, season and availability. 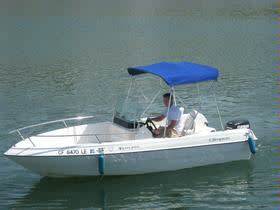 Boat and PWC configurations, colors and features may vary slightly by location.